Successfully Added Mobile Internet Device (MID) - Multimedia PC with Touchscreen to your Shopping Cart. 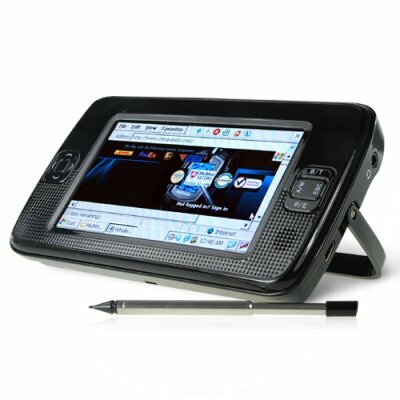 Mobile Internet Device (MID) - Portable Multimedia PC with Touchscreen. A convenient Wifi and GPS capable ultra mobile personal computer. Coming in a highly optimized form factor, this flexible multimedia M.I.D. offers wireless functionality for mobile internet access using Bluetooth 1.2, along with the ability to view most of today's common file types such as PDF's. With a high quality 4.3 inch color touchscreen display (480x272 resolution) you are ensured of viewing crisp text and images in all your documents and favorite web pages. With the included stylus and navigation pad, you can enjoy an intuitive and highly responsive user interface in which to access the many features available at your fingertips. With the onscreen keyboard, choose between large and small keys for maximum convenience - there are even gestures to save valuable time. This powerful mobile device comes with the Windows CE 5.0 operating system to give you ready access to office productivity software (Word, Excel, PowerPoint and PDF Viewers) and Windows Media Player for Mobile 9.0 to provide rich multimedia functionality right out of the box. Watch your favorite movies, listen to your personal selection of music, view and edit photographs or read documents with ease - the choice is yours! The PDF Viewer ensures that you have a fantastic reading experience with your favorite e-books on the superb 4.3" Touchscreen. The superb visual clarity and large size of the screen will provide you with a incredibly flexible portable reading device while on the move. Why carry heavy books when this powerful device in a compact form factor provides exceptional functionality? This device would be perfect for those who travel and read a lot. However, unlike the Kindle, you also get easy access to great multimedia and internet functionality, along with a host of other impressive features. If all that wasn't enough, this model comes with precise and responsive GPS functionality, provided by the built-in GPS receiver chipset and high sensitivity STARIII GPS antenna. This multimedia PC would therefore be the perfect cost-effective GPS solution for those who travel both inside and outside of their car frequently. With the high quality onboard GPS receiver, you can be confident of accurate directions to where you want to go when you install an SD card with your favorite brand of navigation map software**. By using an SD or MMC card and you can enjoy a rich audio and video multimedia experience in minutes. The device also comes with key applications pre-loaded such as Internet Explorer, MSN 5.0 and Skype for Pocket PC to expand your options even more. Surf the web and stay connected with your work colleagues, family and friends. This superb mobile internet device packs an incredible feature set into a compact form factor. Designed with entertainment, information and communication in mind, this sleek multimedia PC provides you with the freedom to stay productive, stay connected and to have fun - wherever you are. Can be recharged from the power adapter, the car charger or by USB. Can I install additional software onto this mobile device? Yes, the device has a storage memory of 2GB using NandFlash. Can I update the OS? No, this is not possible. Does it have Wifi, can I go on wireless internet? Yes, this MID has wireless capability and is able to use wireless internet, e.g. a coffee shop with a Wifi hotspot that provides free wireless Net access. Yes, this MID has wireless capability and is able to use wireless internet, e.g. a coffee shop with a Wifi hotspot that provides free wireless Net access. the price for 50 pcs-good price.